Can aluminum panel connect to CPU cooler? Discussion in 'Overclocking & Cooling' started by Hashiriya415, Mar 17, 2019. I'm going to be building slim ITX and was wondering if I could use the aluminum side panel to connect somehow to CPU heatsink. Has it been done? I'm trying to google it, but no results. I'm thinking of brazing bolts to heatsink so the panel can put some pressure against the heatsink. Add some thermal grease. Or could I maybe buy those heat transfer tubes or whatever you call them. The copper ones they put in coolers. PS there will be a fan. And I need to figure out what CPU cooler to get. There is no problem electrically, the case is grounded (from connection to the PSU) and the heatsink isnt connected to anything, not even the CPU. Even if you delid and use metallic paste there is still a layer that isolates the CPU electrically. The only concerns are mechanical. There are a few case manufacturers that produce mITX and NUC cases that run heatpipes from the CPU to a finned aluminum block on top of or on one side of the case. Example. The thin sheetmetal aluminum (or steel) used to construct most cases would be insufficient as a heatsink. I guess there is no way to bend heatpipes? FC5 Alpha case is nice. I'd like to build something like this. Just hopefully don't have to cut mosfet heatsinks to clear heatpipes. But need to also fit 3.5hdd in there. There is something funny about a passive "fanless" case build with at least 6 very small (40mm?) fans inside it. Tiny fans tend to have the worst noise/airflow ratios. GPU likely has fans too. Could probably achieve the same effect (low/no perceived noise) with a larger normal case using a proper layout and good 120/140mm fans at low speed. I have no clue why this builder put those small fans there. Maybe the GPU has no inlet or exhaust... If it was me I'd make sure there is a hole on the other side for the GPU and I wouldn't use these little fans. It can be done . Here's a totally passive case I put together ages ago. It's a 100% passive machine.....I think it's running a p3 of some sort, I forget. The box is a 16x16 inch steel electrical box. The cpu and northbridge are attached to the case via those copper strips. Nice. Temps worked out well? Have you compared to normal cooler? They are all pretty much the same premise. Run heat pipes from cpu and gpu to case, done lol. TDP is always very limited. The temps were worse than real coolers,but within spec.
. Run heat pipes from cpu and gpu to case, done lol. TDP is always very limited. The TDP on a passive system is 25% of full load at best. 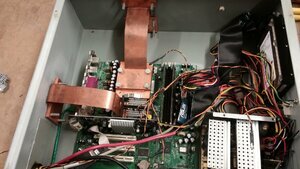 Don't build a gaming rig (or even a good media box) this way, unless you are custom machining the case from pure copper.